Technically it was All Souls' Day, but my parish celebrated All Saints' Day this past Saturday. I offered to organize it this year with the help of some of my fellow parishioners, my mom, and my friend Katie. I shared a lot of my ideas in this video and blog post and it was really fun to get to see all my ideas play out. The night was a blast and everyone left with big smiles on their faces so I'd say it was a success. Want to see some pictures? Oh good, because I've got lots! Guests were greeted by this arrangement. I borrowed the straw bale from my dad, who also got me the corn stalks from his cousin, a farmer. The purple tablecloth was just one of the cheap plastic ones from Wal-Mart. I like how it adds a fun pop of color. The pumpkins and gourds were donated by a local pumpkin farm and picked up the day after Halloween. The white board (decked in a "creepy cloth" that cost $1 at the Dollar Store) reads, "All Saints' Halloween Party" and below it is the prayer, "Eternal rest grant unto them, O Lord, and let perpetual light shine upon them. May the souls of the faithful departed, through the mercy of God, rest in peace." My goal in the decorating was to make the church hall not look like a church hall -where we hold CCD and Coffee & Donuts - but a like a Halloween party. We decorated the tables with more colored plastic tablecloths, more donated pumpkins, and little plates with fall-ish candy. There were two focal points in the room: the stage area, which is the black area in the back of the room in the above picture, and the buffet table. More plastic tablecloths, donated pumpkins, and lots of good food. Each dish was labeled with a tented piece of cardstock that included an image of the saint. I am not very good with graphic-y things and so the labels were a little on the lame side but they got the job done. Our sub sandwiches were also donated, which really helped with the cost of the party. Michael's Italian Feast and Ackerman Farms were both really generous and helped us throw an awesome party. St. Francis' Animal Crackers, served with some purple frosting for a sweet, Halloween-y dip. Several people - mostly men - asked where the wine was and so maybe next year we'll add some spiked cider for the adults. Our priest juggles. Kids love it. My husband helping our little St. Joseph get some food. My St. George and Holy Mary, Mother of God enjoying their supper. After we ate I took to the stage and talked about how we're like pumpkins. If you watch the video here that will make a lot more sense. Then the kids were invited to come up to the mic, one at a time, and tell about the saint they were dressed as. It was SO cute! Once all the kids who wanted to had taken the stage we all prayed the Litany of the Saints. I had written the basics on the board and then we made sure to invoke every saint who was "present" with us that evening. It was really neat to see everyone pray together that way - the little kids so excited when "their" name was called out and the parents engaged as well. The stage area is a regular fixture of the room, I just hung black plastic tablecloths to better designate the area. The wanted it to look like a cemetery - where all the saints were speaking - and so I made a couple of tombstones, set up some more of the donated pumpkins, and snaked about some white lights wrapped in tulle. The picture doesn't do it justice - it looked like a fog was rolling through the cemetery and was just the right touch of spooky. After the Litany we opened up the games. First up, kids grabbed a brown lunch bag and wrote their names on it and decorated it however they wanted. They also grabbed one of the "Finding Truth in Halloween" books. They then went around the room, playing games that were being supervised by our confirmation students. This racing game was thought up by our pastor. Two gutters are filled with water. Two laminated pictures of Jesus are taped to sticks, stuck into pieces of foam. At the other end of the gutters are laminated pictures of Peter stepping out of the boat with the other apostles. The kids would then use paper plates as fans to race the floating Jesus down the gutters and the first to get him to Peter won. This is the St. Therese's Shower of Roses game. Kids got three bunches of roses for three tries to get the flowers in the basket. This game is always super popular: St. James and St. John's Fishing Hole. The kids fish for little baggies of Goldfish that have pipe cleaner rings on them. There were even more games but those pictures include other people's kids so I don't want to post them. Towards the end of the games I announced the winners of the costume contest and the prize for best presentation. I then invited everyone to take home a pumpkin for their Thanksgiving decorations, and got myself a Holy Ghost. It was so much fun - a fantastic parish event - and I hope next year even more people come to enjoy the celebration. BONNIE! This is awesome. So, so awesome. In fact, after I saw your video I looked at my husband and said, "why doesn't our parish do an All Saints party?" Then, I dreamed I threw a killer one with you ;) Pinning this. You are so brilliant and awesome to share these gifts with your parish! Thank you for all of your work Bonnie. It was our best All Saints/Halloween party yet! Looks like this was a fun party! What a fun party! I love the graveyard fog. Amazing! Great job, Bonnie! You have inspired me to *maybe* try for this at our parish next year. *Maybe* I just need the courage to take it on! Leanne, you should! Just recruit a few people to help you and it can be a lot of fun and not a lot of work. I would suggest mentioning it to your pastor soon, though, so you can get a budget. :) I think ours cost about $75 and about 50 people came. How awesome! 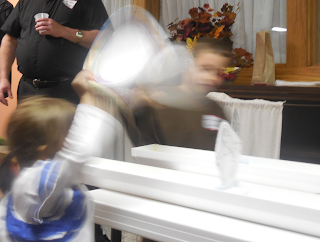 What a great balance of light hearted fun and faith centered activities. Cheers to you! LOVE THIS! Our parish had a all saints party for the first time, but we didn't have a ton of themed food! Next year!! AWESOME! All that needs said. awesome. I am doing this next year with some friends for sure. Great ideas! You are the shizzz. I need some of those St. Luke bones...mmmm!